Dusty, yes the planks have been glued, and that is the problem. 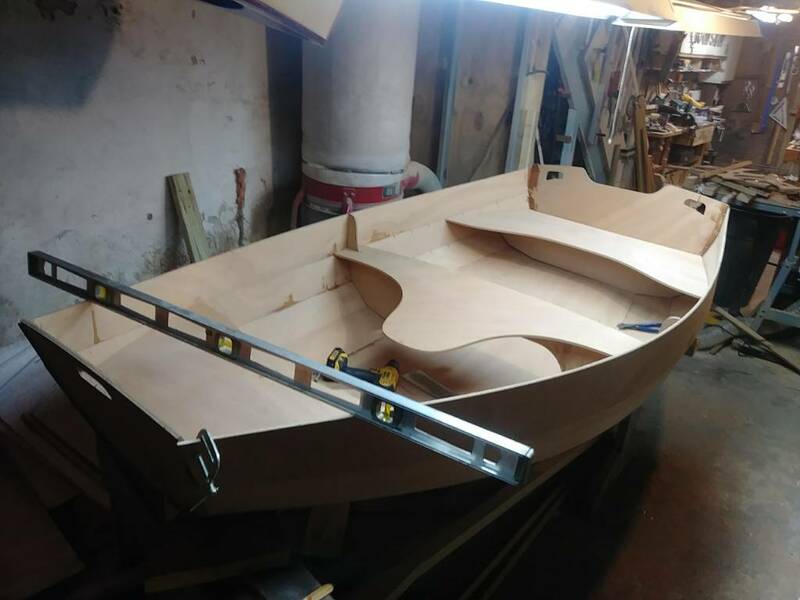 The bow and the stern panels weren't even close to fitting properly although I did get the transom to fit pretty good but I'm having a Dickens of a time with the bow. 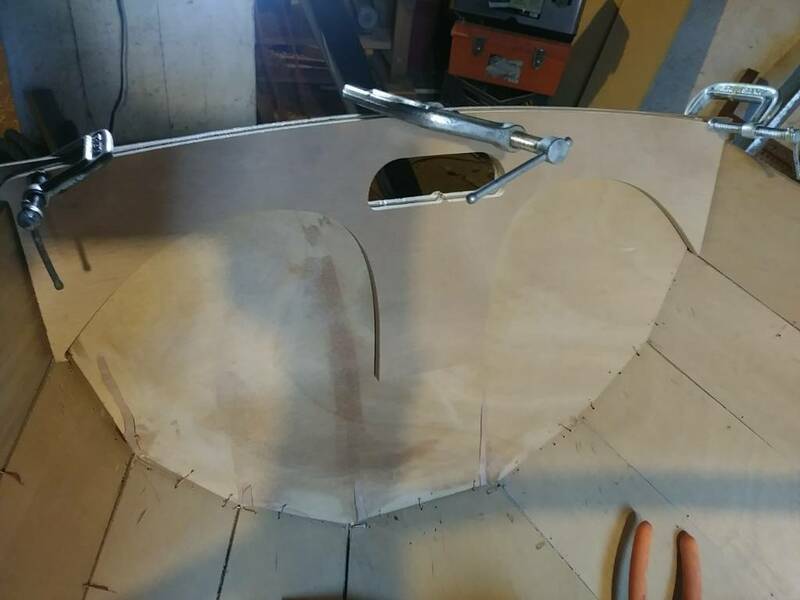 1, Make a larger bow panel. 2, Saw separate the plank joints. 3, Go for and live with a very large fillet! Last edited by DeniseO30; 04-15-2019 at 09:45 PM. Took about an eighth of an inch off the bottom center that helped quite a bit. 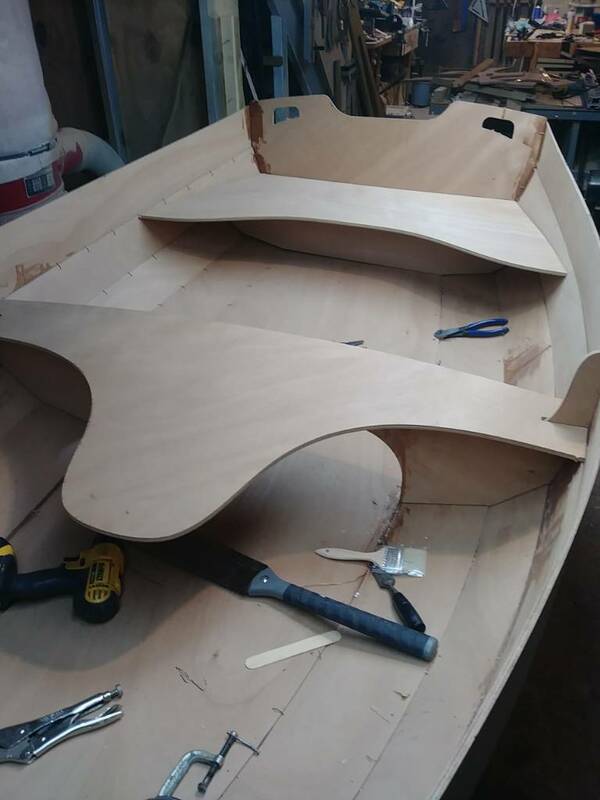 The bow panel has been breaking the little knubs off the top which will make bow panel top flush with the the sheer plank top edge, not a bad thing. 2. See Hugh's quote regarding heat. Realigning planks in the proper place would be the most craftsman, craftswoman or crafts non-binary way of doing things. 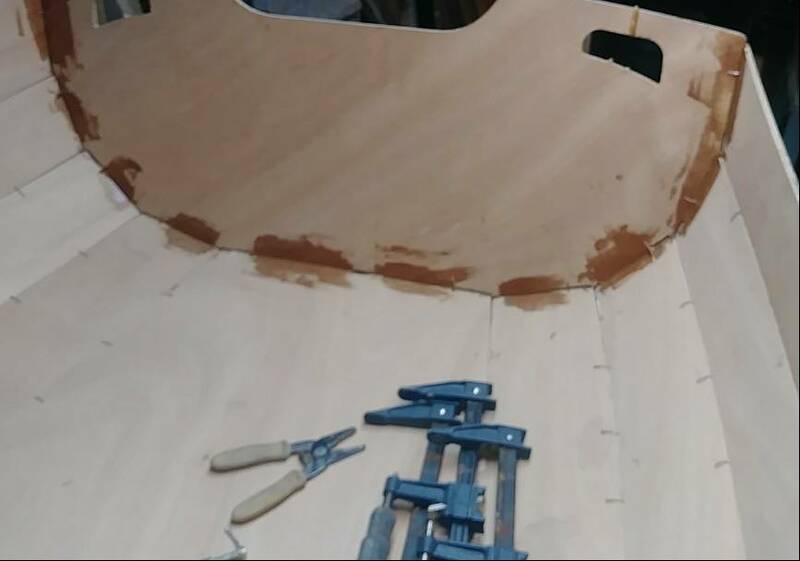 The only problem with heat is that is that you would need to remove ALL of the thickened epoxy from the rabbet and that might hard if you only partially separate the planks. If you saw them you would definitely need to glass the joint, probably on both sides. 3. Definitely going to be the quickest and dirtiest way. You would absolutely need to glass this though, with maybe several layers. 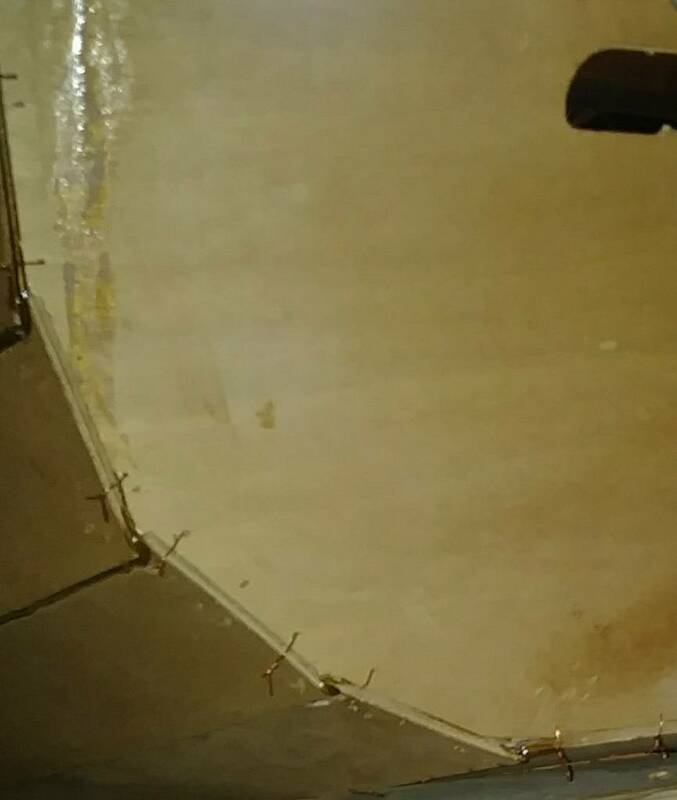 Thickened epoxy, while tremendously strong, is quite brittle. If you're going paint this is the way to go. Somehow... I got it to fit, drilled lots of little holes and twisted lots of little pieces of wire, holding it all together! I used my pointed bar clamps to draw the planks against the panel this time after about 50 tries; It inexplicably went into place, actually closer to the ends of the of the planks that it was originally. I'll double-check, true up everything tomorrow! Make sure it all goes where it's supposed to,. 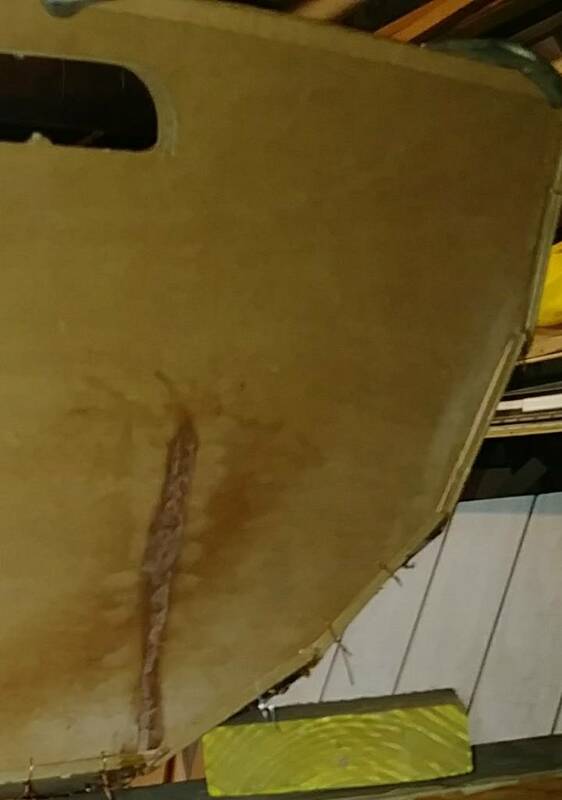 and *maybe* mix up some glue, & tack the panels in place so we can start removing wire ties! 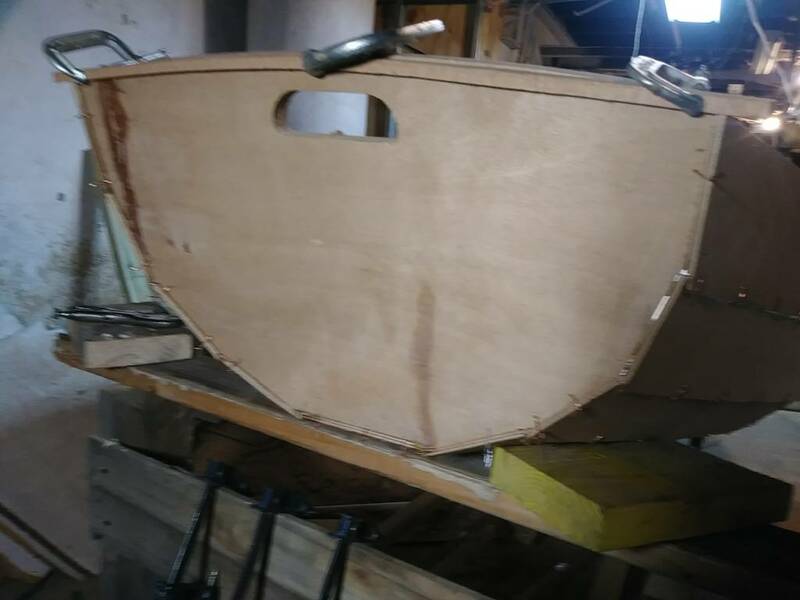 Once again the center bulkhead is basically the key to the shape of the whole boat. Thanks Hugh! It really was a knock-down drag-out battle getting that piece back in there! I'm glad to see everything coming together without major surgery. Pulling out the wire ties that's going to take a while! Also thinking (there I go again!). 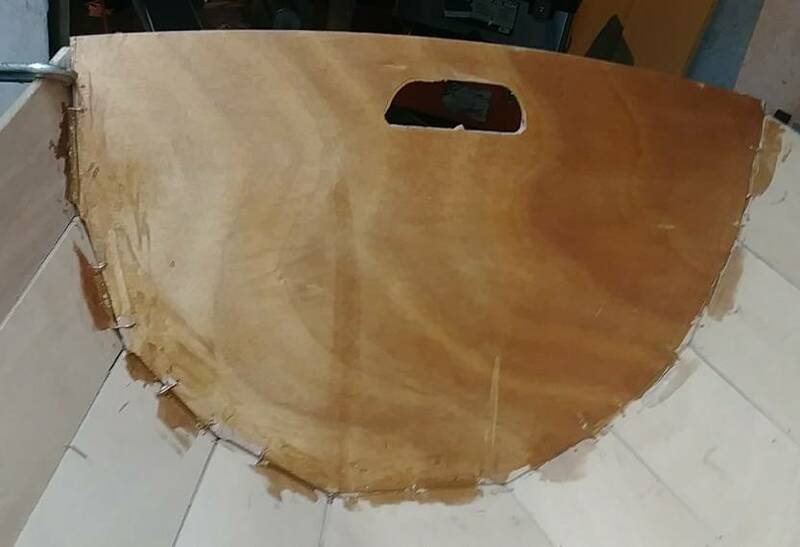 the centerboard slot could be cut before glassing the bottom this way I can glass the inside edges. 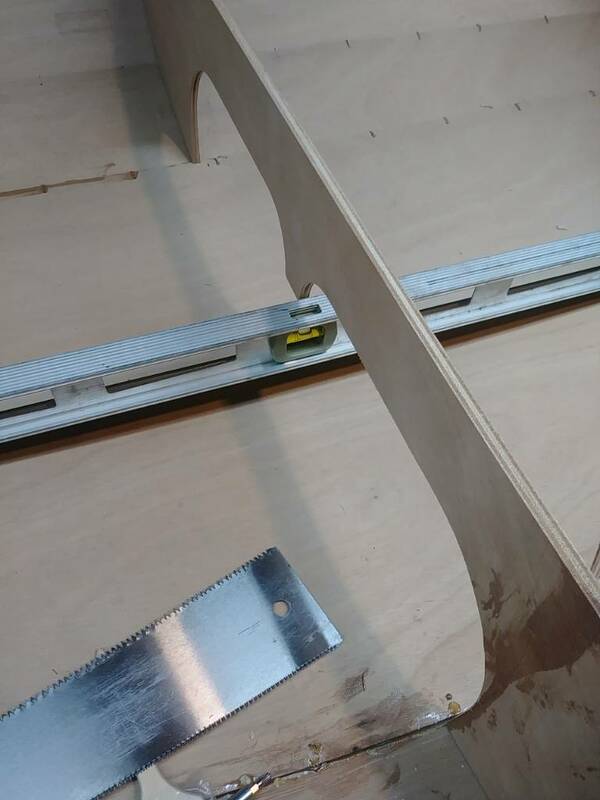 I will have to check width of the center board in relation to the slot. I still have graphite powder (for the centerboard) but in my experience it's not worth the trouble. Last edited by DeniseO30; 04-17-2019 at 08:04 AM. I hear ya Denise! I'll be 71 this summer and I feel every hour of working in those odd bent over positions more each year. But I feel worse just sitting! Are you planning on painting? Might be worth just clipping the wires flush and sanding them smooth since they'll be fully encapsulated by the fillets. That's what I've always done...but none of my boats ever sit in the water for long. Don't think I'd do that on a moored boat. But a dinghy like yours it should be fine. Never tried assembling upside down...let us know if it works (if you try it). Could save some backaches! Not too shabby! Just set bulkheads and thwarts in place. I do NOT LIKE the slow hardener it's firmed up but still somewhat tacky something like 12-16 hours in 50-60 degree-ish temperatures. Last edited by DeniseO30; 04-17-2019 at 10:45 AM. 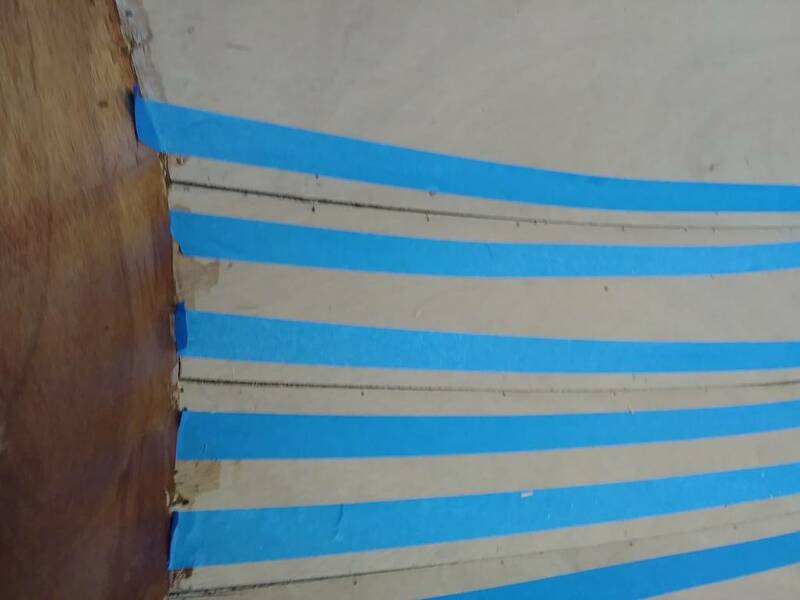 An accurate way to level the hull fore 'n aft is to pick off the heights from the drawings for reference points on the bow and stern. 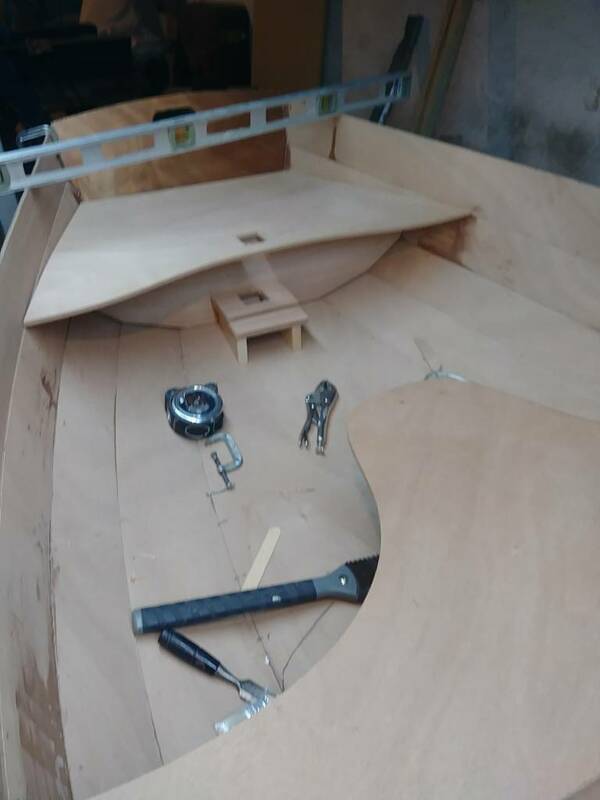 Soon after leveling the hull I like to permanently mount one or two of those tiny bubble levels in the boat where I can see them to adjust the correct trim while sailing. They're handy for releveling the hull during construction too. Especially to accurately establish the rake of the mast. Sense that I'm getting is you don't want to wait. Mast rake is the only really crucial thing affected, and you can delay setting that until the drawings are in hand. Making good progress Denise. 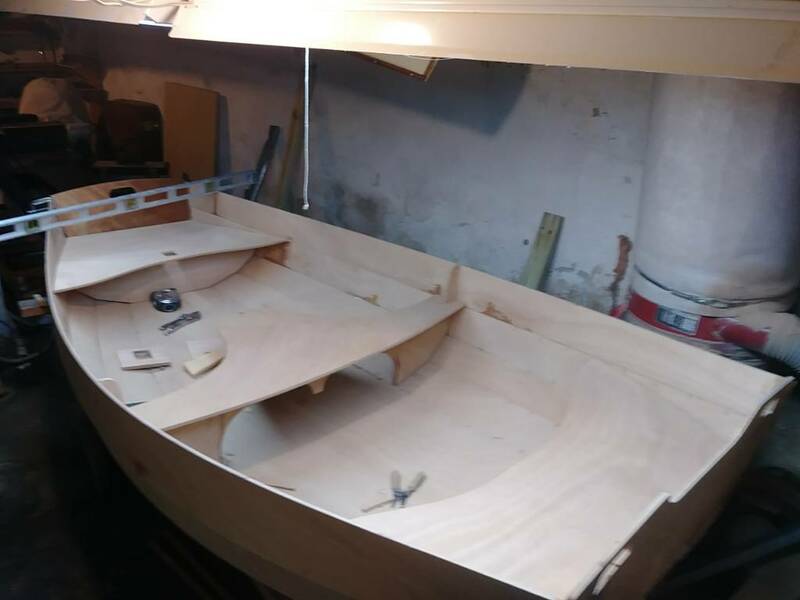 It's only been a few days I should have to plans by the end of this week, all that aside, I'm really not in a rush it just looks like I am, the way the bulkheads go in pretty much locks them at the angles designed in. But, there is a real potential for water to puddle in the corners if it's not right. Here again, it's probably something few people would even think about. I have an adjustable mast step idea in mind but I don't think it's necessary on this little boat. 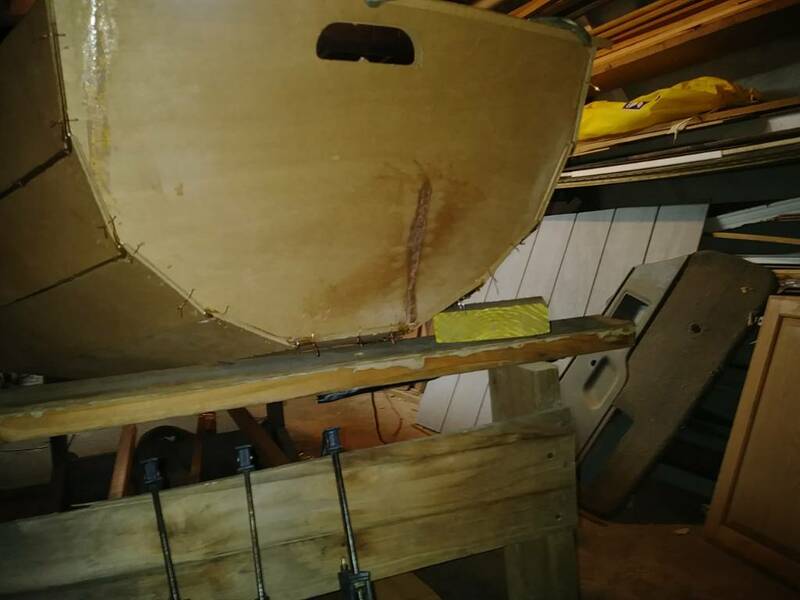 IMHO, strategically placed limber holes in frames and drain holes in thwarts are a better solution to puddles because they're still effective when the boat isn't stored in a precisely level position. Anders if you look at the picture of this boat you see all that's been taken in consideration by design. 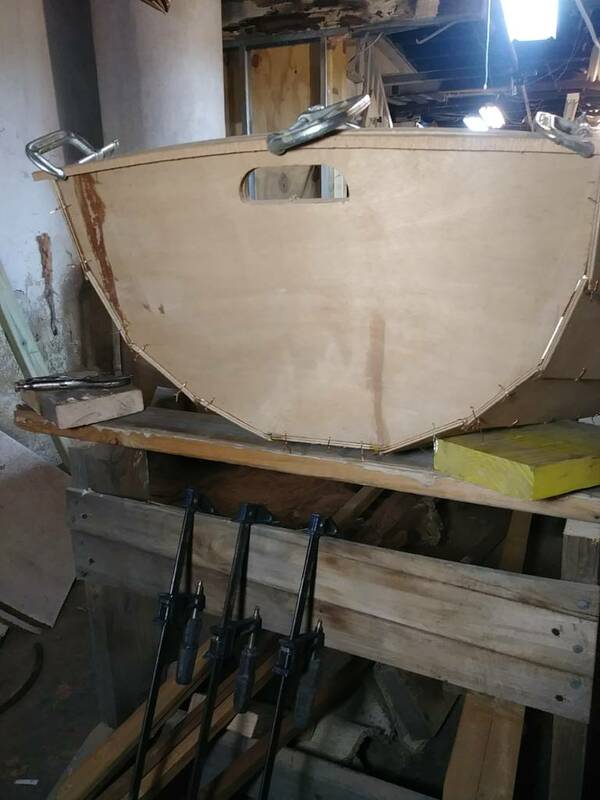 Any and all water will gather around the center bulkhead and daggerboard trunk. I just epoxy coated some of the panels my hands hurt from taking out the wire ties, so I'll give them a rest. We, now just me, never used slow mix. Been using West systems forever, but MAS came with this build I just need to get used to "waiting". CLC plans should provide the exact fore and aft elevations of the bulkhead, seats and thwart. My plans did. This should eliminate any puddling. CLC typically ships slow hardener with their kits because the alleged non-blushing characteristics soothes the qualms of nervous first time builders. Terry Otis from CLC answered my question. where I put the level is the same as putting the level on the center thwart/seat. So experience in building proved correct! Last edited by DeniseO30; 04-19-2019 at 11:00 AM. Getting some masking tape down in anticipation of doing the fillets. Looks like the bottom first one, is going to have to be wider because it's almost flat where is the others have more of a vee l to them. All the wire ties are out! And it didn't fall apart! Last edited by DeniseO30; 04-20-2019 at 09:17 AM.